Though Milwaukee's infant mortality rate dropped for six years in a row, it still remains at crisis levels, a new report says. Overall in Milwaukee, more than 10 infants died per 1,000 live births from 2009 through 2011. But the problem is especially acute for black babies, who die at nearly three times the rate of white babies in Milwaukee. The numbers are contained in the Milwaukee Health Department's 2013 Fetal Infant Mortality Review. It summarizes the factors that contributed to stillbirths and infant deaths and recommends streams of actions the community could take. Health leaders delivered the report to a Common Council committee on Thursday. According to the review, nearly 60 percent of the infants who died in Milwaukee, died because they were born prematurely. The second leading cause of death was congenital frailties, and the third was unsafe sleep conditions. 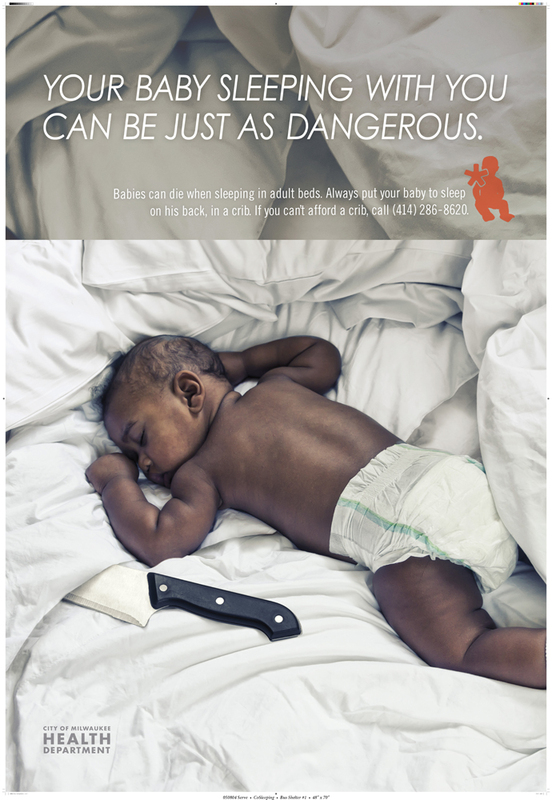 The report tracks data for the same years as city-wide efforts began to reduce the rate, including a controversial 2011 ad campaign against co-sleeping. The report compares Milwaukee to other cities with a similar racial make up and found the city has a worse black infant mortality rate than New York, Louisville and Memphis. Yet Milwaukee's white infant mortality rate is lower than the national average. 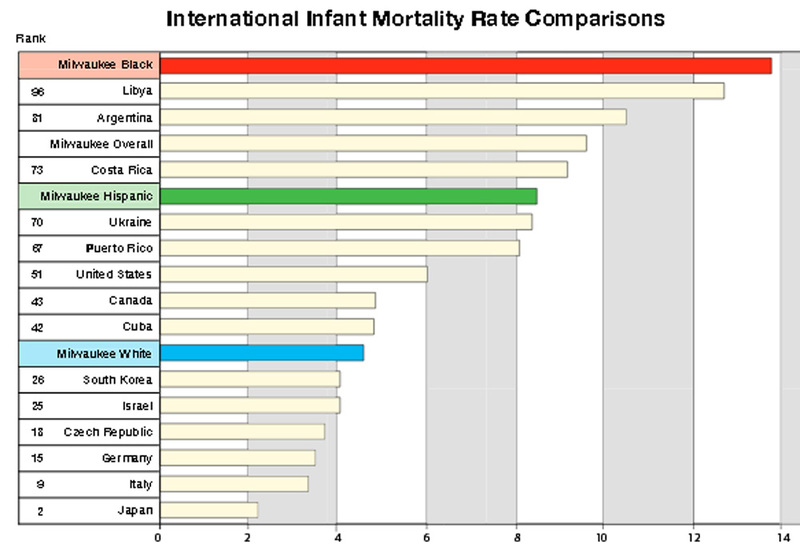 When compared globally, Milwaukee's infant mortality rate is worse than 77 other countries. 1. Encourage women to always take care of their health, not just when pregnant. Jessica Gathirimu, who oversees family and community health services says, "the life of a woman, from the point that she's in her mother's womb and throughout her life, affects the potential outcome of her future pregnancies." 2. Make sure reproductive health services reach everyone. Gathirimu says they must extend to, "having those conversations with youth about pregnancy intendedness. Waiting until you're at a point in your life, not just physically, but emotionally and maybe where you've reached the educational attainment you want, maybe began a career that you're looking for, really, setting goals for yourself and waiting and having that planned pregnancy, because we do know that a planned pregnancy tends to be a healthier pregnancy." 3. Continue advocating safe sleep conditions for babies. They should sleep on their back, alone, in a crib, without soft items nearby. 4. Care for the well-being of fathers. "Fathers matter, and fathers who are healthy in mind, body and soul, can make a difference in the outcome of a pregnancy and the health of an infant," Gathirimu says. 5. Address racism and harmful social and economic conditions. City Medical Director Geoffrey Swain says there are tangible things that can be done. "Everything from programs that improve social connectedness and reduce social isolation to programs that address employment and training, like transitional jobs programs, to work that the YWCA and others are doing to eliminate racism. It's a long road, but we have to walk it." In April, the city will learn its infant mortality rate for 2013. It might indicate whether efforts underway in recent times, have saved lives.